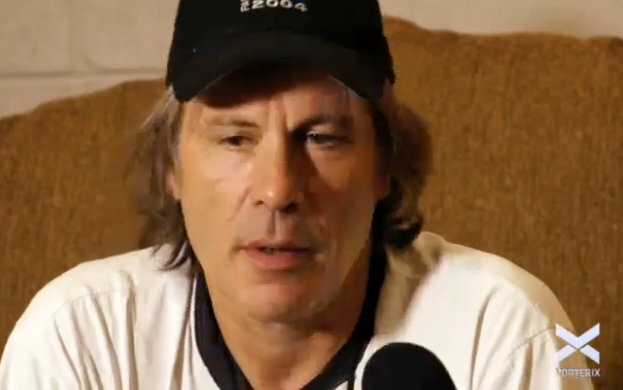 Bruce Dickinson talks about the future of Iron Maiden, maintaining his voice, and some past shenanigans. A recent Facebook update from producer Kevin Shirley all but confirms that there is a new live DVD in the works for the British veterans. But the million dollar question is of course if and when Maiden will release a new album. And Vorterix.com posed just this question to the singer. – Well, I mean, we are going to do another album, Dickinson says, but adds: – When we do it I can’t tell you. In a reveal that’s sure to delight fans around the globe he also says that the band has already started to write material for what will be their 16th studio album. – Actually I’ve written a load of stuff. You know, we’re all writing little bits and bobs all the time. We’ll see what happens, you know. But yeah, sure. 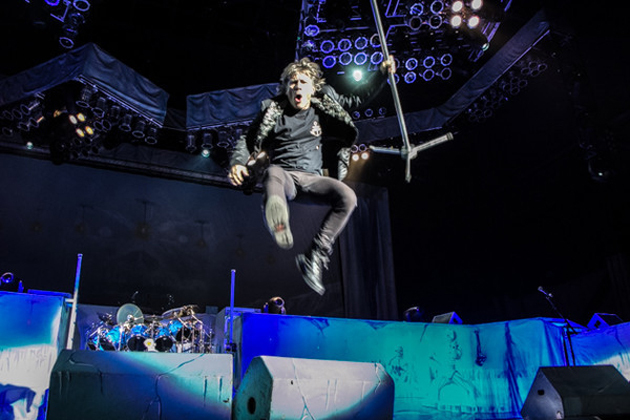 The band has been touring the world for the past couple of years with the Maiden England package, a concert presentation that revisited their classic Seventh Son of a Seventh Son era. Asked whether or not they will do a similar thing with their 90s material in the future, Dickinson gets a little ambiguous. – We haven’t got that far yet. Let’s finish this one first and see what happens next year. But yeah, I do not think Maiden fans are going to be too disappointed for too long. He also says that he misses playing some of the Powerslave tunes (even though two of them were in the Maiden England set) and even older songs like Children of the Damned and Revelations. At this point in the interview Bruce delivers a second early Christmas present to the fans, stating that Maiden have plenty of tours ahead of them. In contrast to other classic rock and metal bands like Guns N’ Roses, Metallica, Mötley Crüe and KISS, Iron Maiden always stayed clear of the bad boy image of wild parties and overblown excess. Dickinson claims that this hasn’t been a conscious decision. – No, it’s just kind of what we’re like, really. I mean, I’m not saying that nobody in the band has ever tried or mucked around with smoking dope when they we’re younger. Most kids have probably tried smoking dope. Most kids have probably tried a few other things that I’ve never tried. In fact, lifestyle choices have threatened Maiden’s stability in the past, and been the cause of at least two departures from the band years ago. But Maiden are still around, and as good as ever, 35 years on. – The reason why we started Maiden, the reason why we all became musicians, was because we wanted to be musicians, not to become druggies. We like a beer and beer is our favorite kind of stuff. We drink beer and we drink a little wine and too much coffee. That’s it really. Apart from that we’re just trying to have some fun. In another contrast to most other rockers his age, Dickinson is still able to belt out the lyrics to high-register anthems like Aces High and Run To The Hills just like he did decades ago. How has he kept his voice strong through all these years of intense performances? – It’s kind of like a guitarist, you want to know about your instrument. You want to know why it sounds like it does, how to look after it. The one thing you can’t do with the voice, you can’t put new strings on it. The singer muses that the voice is such as subtle thing. – And it does change with age, as you mature, as the spaces in your body change shape, he says. – All these things has a bearing on your voice. It’s like a wooden kind of instrument, the wood gets older and it develops tone and you get subtle changes. Iron Maiden’s potential certainly changed with the return of Dickinson in 1999. His voice is a key ingredient in the witches’ brew that allows Maiden to alternate new albums and History tours and gives them the ability to execute any song in their catalog on stage. Almost 15 years on, Dickinson still maintains his voice in impressive shape. The Maiden frontman highlights the importance of taking care of your voice when something is wrong with it. He estimates that he has only cancelled about 25 shows in over 35 years as a performer, but those cancellations have been important. – That could be the difference between me keeping my voice or not keeping my voice. I’ve never taken steroids or these awful jabs they give you. If my voice is so bad that I can’t get it to sing without it, I shouldn’t be singing. Dickinson struggled with a cold at the end of the Maiden England tour, but that didn’t stop him from delivering a top-flight performance. Dickinson is certainly a pro when it comes to dealing with the occasional cold, and he knows where to draw the line. – If I’m sick with a cold, I can get through it, he says. – If I’m really sick with laryngitis or bronchitis or something, I just take the doctor’s advice. It’s better to cancel three shows and have your voice be excellent for the next 300. 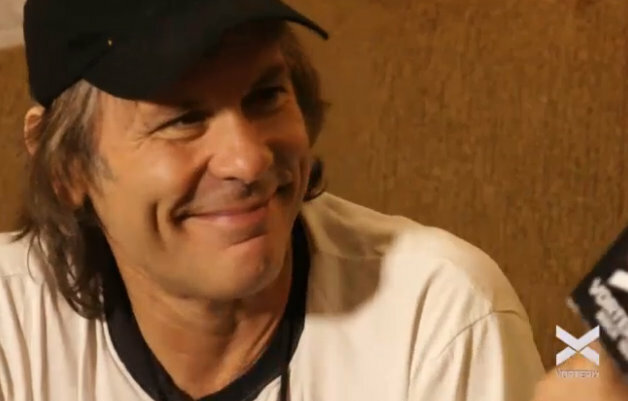 Dickinson is still keen on developing his ability as a singer, even if his past and current voice work can be admired in the already long line of Iron Maiden concert DVDs available. – I’ve kind of got my own style now, in a way. So I’m sort of investigating what I can do with my voice. I’m still trying to do the stuff I did when I was 23. But I can do stuff now that I couldn’t do when I was 23. So I’m looking at ways of how can I do some different things with my voice. How can I introduce different tones? As I get older it’s quite nice to have that stuff to be able to do with your voice, it gets fatter and it gets deeper. It’s not very often that interviewers quiz Dickinson on the maintenance of his incredible voice, but here we did get some info about how the great singer thinks and works. And Maiden fans can rest assured that there is a new album and plenty of tours coming up in the not-too-distant future. Maiden Revelations sends a big thank you to Vorterix.com for asking Bruce really good questions that fans around the world want to hear answers to! And many thanks to GhostofCain for pointing out the interview! oh i’d ask so much different questions than what he thinks of when he plays the trooper for the 20310392nd time…. ( -.- ) but still we got confirmation that there will be another album (not excluding the possibility about it coming out next year). Otherwise we got the same information we already had.. Anyways.. always great to watch a legend talking..
Well, Bruce has already ruled out a 2014 album in a previous interview. They would have to start writing and rehearsing the album next month to have it out by next year. Not happening. They’re touring in the summer. 5-6 months off before that. Keep in mind, TFF was recorded Jan-March 2010, and released in August of that year. Theoretically, if they entered the studio right away next year they could have a short summer tour before the new album comes out. I’m still not ruling it out, given that the band are known to not always tell the truth when it comes to speculating on future plans. Seen them 16 times, wanna get to 20. Sure looks like you will! yea god news ,its time for a new album,wir auch mal zeit ich bin gespannt und freu mich trauf. I’d have asked about setlist changes, but I guess that question is rather for Steve than Bruce. Anyways, VERY excited to hear there’ll be lots of tours. UP THE IRONS! No, you’re right, the setlist would be another important subject. The setlist is primarily down to Bruce and Steve, according to Janick in a Sweden Rock interview in 2010. Adam, the schedule for The Final Frontier is exactly what I base my “ruling out” on. They started writing and rehearsing The Final Frontier in November 2009 before hitting the studio in the new year. If Maiden are to have an album out in 2014, they will have to start writing and rehearsing it next month. But Maiden never start writing and rehearsing the month after finishing a world tour, so you can definitely rule it out. True, but if you push the timetable of TFF back a couple months, the album could still come out before the end of 2014. I don’t think it’s likely- but it’s possible. Here’s another though: what if they do release a Donington DVD Box Set next year? That would be the perfect tie-in for a summer tour based on History part 4. And no matter how you push the timetable for the next album, 2014 isn’t gonna happen. They spend at least 4-5 months from the start of writing and rehearsing to completing the recordings. And even when they’ve completed recordings, the album will still be months away from release. That’s probably why Bruce said “NO” when asked if there would be a new album in 2014. He said 2015. 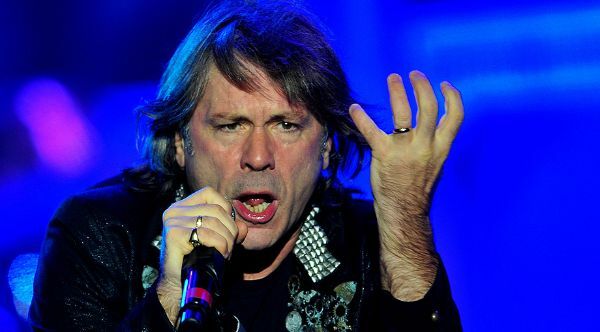 He knows Maiden are not going to end a tour in October 2013 and have a new record out the following year. That kind of turnover hasn’t happened since he came back to the band. I have to concur that as a Maiden fan since ’82 I am stone cold shocked he can still sing those songs like that. He voice actually sounds stronger than on the Powerslave tour. Yes on the new album but get a producer who makes Steve Harris cut out all the extra bits, get this thing distilled and mean. There is no producer on the planet who is going to make Harris do something he doesn’t want to do. We know him well enough to be sure of that. If you wish for shorter songs, I’d say your best hope is that Adrian, Bruce and Janick write such songs. Adrian said in an interview that maybe they overdid it with the long songs and that they’ll probably try writing shorter songs…. So the thought of shorter songs is already in their mind… But personally if it’s an album full of “alchemists” or “el dorados” i’d prefer one full of “paschendales” and “for the greater good of Gods”… But only if the big length of the songs is really needed, like on Amolad, and it’s not pushed, tiring and “overtried” like on tff. They will really have to give 100% of their attention in the new album, and not “write some lyrics to a demo tape on the go” like bruce said or “allow themselves 2 weeks to write the album come up with 7 songs and a couple of ideas wrap it up and finish it on the studio” or the album sounds like a jam etc. etc.. This type of recording worked on “AMOLAD” but i’m coming to think that this may’ve been a “happy accident”. I guess it will all depend on how Bruce reacts to those shorter tunes (if they exist). I remember reading an interview with Adrian after the reunion (I think if it was promoting “A matter of life and death”) in which he mentioned that he had showed Bruce some ideas for shorter songs, but that he reacted more enthusiastically about the epic stuff. Although there are some fantastic songs in “The final frontier”, I think “A matter of life and death” is overall a better album (it is my favourite one since the reunion, up there with the 80s classics). That being said, I also think “The final frontier” is a better collection of songs than “Dance of death” or “Brave new world”, and all of them better than some of their 80s output (and all their 90s output). Anyway, we can discuss this until the cows come home, but basically Maiden will write the album they want to write. I hope it is a good one and, if their recent output is anything to go by, I guess it will be. Let’s hope they pull out all the stops to make it a great one. I completely agree about AMOLAD. That’s the post-reunion album I think is up there with the best of their 1980s records. I was fairly pleased with TFF when it came out, but looking back now there are just 3 tracks I think are really strong: El Dorado, Coming Home and The Talisman. I also think Mother Of Mercy and Starblind are good. But overall, AMOLAD sits in a different league for me. I’m really curious about where they will go from here. Christer, I think there is more strong material in that album than just ‘El Dorado’, ‘Coming home’ and ‘The talisman’. While those three are really great Maiden tracks (‘Coming home’ is probably in my personal top 20 of Maiden songs), ‘Starblind’ is also really good (amazing lyrics! ), ‘The alchemist’ is a great rocker (one of the best short songs they have written since the 90s) and I really like the groove of ‘Where the wild wind blows’. Most of ‘Isle of Avalon’ is pretty good (although I am not a fan of the final part of the song) and the same can be said about ‘The final frontier’ (the intro was too long though). ‘Mother of mercy’ and ‘The man who would be king’ are not on the same level, but to these ears still certainly more enjoyable than most of the stuff they released during the 90s (with very few exceptions like ‘Be quick or be dead’, ‘Afraid to shoot strangers’ or ‘Fear of the dark’…). SakaRaka7, I think I agree with you now that I look back on The Final Frontier. I went through the process of reviewing Maiden’s 80s records last winter for Maiden Revelations, and I found some things I didn’t expect. My next project will be reviews of the 90s catalog. Punchier shorter songs, heavier guitar tone, one great epic. The prog route has been done to death since The X Factor, there’s really nothing left to be brought on the table. I guess it is time to go back to a 50 minutes album with 8 or 9 songs on it.